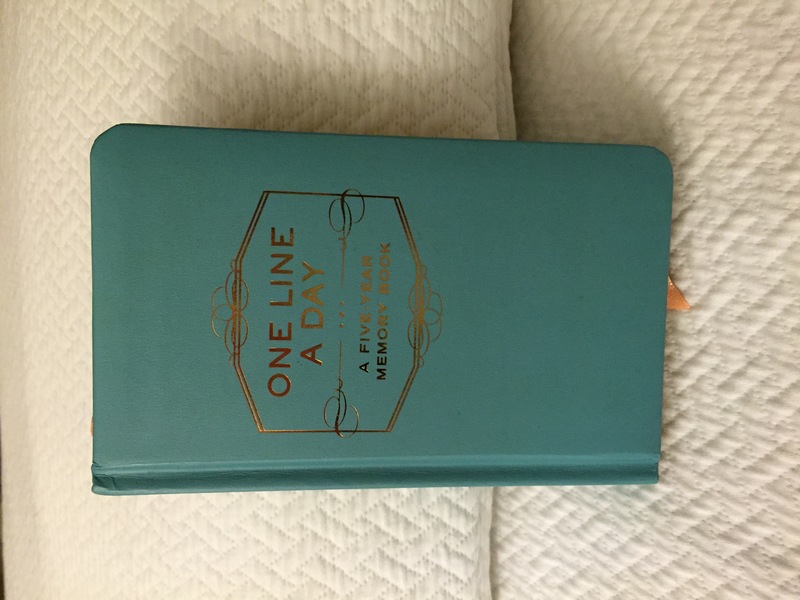 It’s a sweet little volume with spaces to write just a few words about each day of your life for up to five consecutive years. It was a thoughtful gift from my daughter, who knows I love to write and journal and keep memories, at least with words. (Pictures are another story. Observe photog skills above.) I fell in love with this little gem immediately, and wrote in it enthusiastically for five, ten, fifteen days in a row. And then I put it on a shelf and forgot all about it. 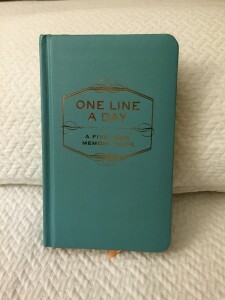 Until a week ago when a darling friend of mine who, due to her modest nature, shall remain nameless (I got your back Shalom), posted a picture holding this exact book and stated that she’d met her 2015 resolution by writing one thing she’s thankful for in it each day. What a fantastic, fabulous, fantabulous idea, I thought. I will write one thing (or more) that I am thankful for, every day, in this fine little book for one fine little year. Do you mind if I share today’s entry with you now? Don’t worry, I won’t make it a habit; I know being forced to read stranger’s journal entries is what gives blogging a bad name. But bear with me just this once. 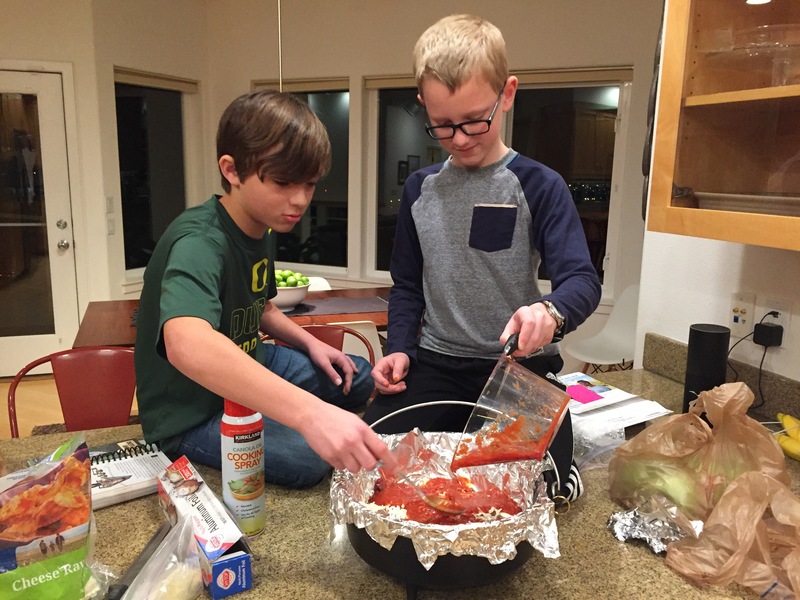 Ethan and his buddy Austin making dutch oven ravioli for Ethan’s “Cast Iron Chef” scout badge. Ethan had to plan and cook a meal using the dutch oven, so naturally he asked if he could make his favoritest food in the whole wide world forever and ever amen and the end: ravioli. Go figure, we found a recipe online—and here I thought dutch ovens were just for meat and potatoes. Where there’s a will there’s a way, baby. While they were sprinkling mounds of grated Parmesan over the lumpy red concoction, I overheard Ethan telling Austin—with a casually cool authority—about his views on cooking: “I don’t cook very much. But when I do cook, I like to make Italian food. Because it’s…you know…refined.” Austin nodded in assent. Of course it was. Ravioli is refined. Of course it is. And now I’m sitting on my bed in my robe and slippers, punching happy words into a laptop while the Hub watches Big with the kids, insisting they’ll love it because it’s a “classic from his childhood.” (Does he really think that’s a mark in his favor?) I’m relaxed and ready to read, looking forward to another great Sunday tomorrow—church with the family, dinner with new friends. So much to be grateful for today, but I think the refined ravioli tops my list. How do you combine the words grateful and ravioli? Gravioli? Yes. Gravioli. A noun, an adjective, and maybe one day, an adverb? I could write, and eat, and live graviolitiously. And this year, that’s just what I intend to do. I’ve felt a little scruffy this brand new year. The snow and ice sit-in was fun at first, but by Monday night I was ready to put the kids in a sled and push it—gently, mind you—down the nearest hillside just to get five minutes (or five hours) alone in the house. See, much as I love(ish) winter break, I do not think it was intended to last as long as the Flood. I’ve gained a whole new respect for Noah’s wife, trapped in that stuffy boat with crabby kids and cluttered quarters, because after two and half weeks of in-home partying (read: house trashing), we ended the Big Laze with cancelled church, cancelled school, delayed school, delayed school, and delayed school again. It was a dream for the kids. FOR THE KIDS. Cancelled school is a dream for the kids. FOR THE KIDS. And speaking of the kids, and the house, and the kids-in-the-house-for-three-weeks-straight: the Christmas Bomb seems to keep exploding in said house, on a twelve- to twenty-four hour rotation, even though the Big Day was over two weeks ago. I’ve done nothing but bend over and pick things up since Thanksgiving, but the gifts just keep on giving. Like a pebble tossed in a lake, each new gadget creates its own ripple effect of chaos, culminating in a three-foot radius of Crap circling every side. The tree may be down, but the piles still stand high. Come on, mom. You know about The Piles. I’m wading daily through piles of clothes–new ones with tags stuffed beneath old ones needing washed (really kids, why separate them? ), piles of baked goods (stale and grody, but we’re not picky), and piles and piles of papers–important gift receipts, important gift cards, important thank-you card lists because I swear I’m gonna write thank-you cards this year, all buried beneath crumpled grocery lists and scribbled-on post-it notes: return gifts! use gift cards! write thank you cards! But oppressive as they may be, The Piles and The Wrap are nothing compared to The Blankets. Tell me, oh sisters-in-post-holiday-suffering: what’s with the blankets? They. are. everywhere. Slung over the back of the couch, hanging off the side of the chairs, dripping down the seats of my car, wadded in the corners of the family room, spread over the entire living room floor, flat and wrinkled and on purpose, as though we are an Afghan family preparing for Ramadan instead of an American family cleaning up after Christmas. Wait. Did I use the word family next to cleaning? Oh, that’s richer than the stale apple pie coagulating in my kitchen. So last night, despite my anticipation (dread) of another late morning, I set my alarm for six a.m., determined to get my own self, at least, back on some kind of sleeping/waking/eating cycle that doesn’t mimic that of a frat boy. And when the alarm chimed this morning, I’m proud to say that I got out of bed a mere forty-minutes later. I stumbled downstairs and crawled on the stairmaster, ready(ish) to take on the new year. My feet plodded slowly (who made these pedals so heavy?) as I surveyed the nine blankets rumpled across the floor, looking as groggy and grumpy as I felt. I knew that restoring my pre-holiday habits would eventually feel good, but right then it just felt bad. And hard. And kinda depressing—probably because it felt so bad and hard. A sunrise. And with it, just moments after this picture was taken, the sun. The sun. And everything that hot, melty, pink-orange-red perfect sun implied: that something good was about to happen. That things were going to change. That the dark, the cold, the chaos, The Piles, the stifling hibernation of winter–none of it was permanent; it was not our new reality. The sun told me that one day—not too far off—the snow and the mess and the sugar-crabbed, housebound kids would be a memory and we’d be looking forward to the light, fresh-air, happy days of spring. 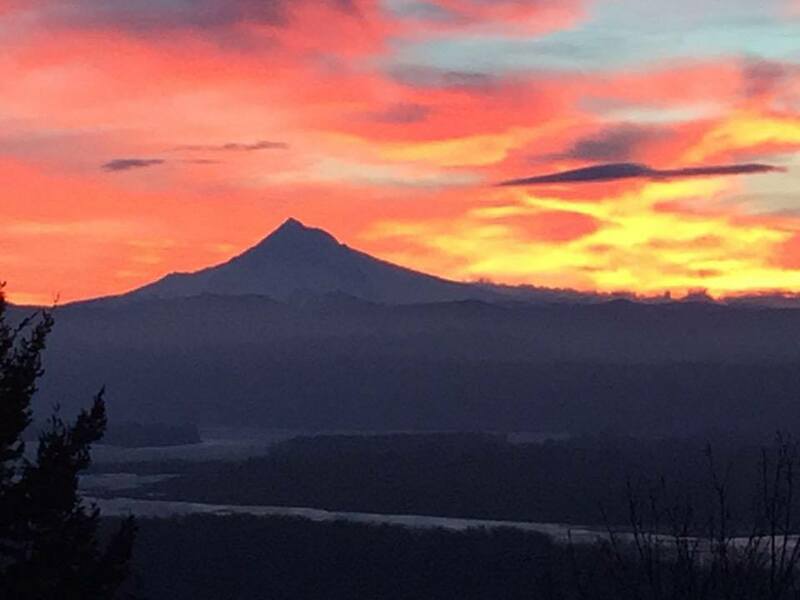 I finished my workout and, before any of my lazy kids got up to start another lazy day, took a lazy moment myself to sit on the (blanketed) floor, look out the window, and stare at the sun. We’re gonna get through this winter, moms, I know we are. Know how I know? Because today, the sun said so.